The sharing economy is thriving because it offers consumers a faster, more efficient, and often cheaper, service or product. At its core, the sharing economy encompasses a new business model that in some industries, such as ride-sharing, is disruptive, and in others is complementary to current businesses. And, in yet others, the sharing economy is a brand new opportunity that is solving big problems and generating consumer demand. But what exactly is the sharing economy? Merrill Lynch estimates the size of the sharing economy at $250 billion with an addressable market of $2 trillion. They also identify a number of sectors that are being impacted by the sharing economy, including transportation, travel, food and retail among others. I’m sure you’re familiar with Uber (Nasdaq: UBER, pre-IPO), as the company has basically become the poster child for the rise of the sharing economy. The sharing economy was birthed by a combination of big data, powerful platforms that run algorithms utilizing that big data, and the ever increasing power of the smartphone. Did you know Amazon is a card carrying member of the sharing economy? In addition to being one of the largest online retailers in the world, the company also matches buyers and sellers of goods through programs like its Fulfillment By Amazon (FBA) program. But it’s not just retail and transportation where the sharing economy is proliferating. In a report on the sharing economy BCG points out an example of a new sharing business formed by Mahindra and Mahindra (OTCMKTS: MAHMF). Mahindra, based in India, is one of the largest tractor manufacturers in the world. But, only 15% of India’s 120 million farmers even use mechanical equipment. And Second, the WEF believes the sharing economy will play a vital role in reshaping the lives of a growing number of retirees. As individuals look to age in place and minimize disruption to their daily lives, companies already at work in the sharing economy will provide a means of earning income as well as provide care for those in need. 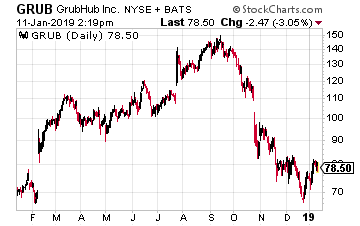 GrubHub is the quintessential sharing economy stock. The food delivery company not only delivers food from your favorite restaurant, but puts in place the entire order and delivery platform for restaurants it partners with. This has allowed non-delivery focused restaurants, on the mom and pop scale all the way up to the Taco Bells of the world, to add another revenue stream to their business model. Match Group owns and operates several dating and relationship sites including Tinder, Match, OKCupid and Hinge. The company has over 57 million users of its apps globally, and was the highest grossing app in the Apple Store in 2017. The company is clearly dominating the dating app space and has built a critical mass of users which makes it difficult for competitors to infringe on the company’s market. Match used the network effect to build out its user base with a savvy “hot or not” marketing campaign. The company’s range of apps now covers a broad spectrum of the population, from young people looking for casual social interactions to established career adults looking for long-term relationships. Match has mastered the big data world of dating, and has built a platform that is both user friendly and profitable. Revenue at their flagship Tinder brand was up close to 100% year-over-year in the latest quarter, and subscriber growth was up 61%. Earnings grew over 126% over the past year. 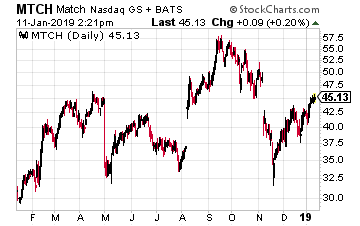 Match also suffered in the market selloff, and is in the process of recovering from an earnings miss last quarter, but has already recovered much of its losses. The company has a few specific catalysts that make it a good buy now. First, it is increasingly moving users to paid subscribers by adding additional relevant features to its paid subscription model. Second, the company is using data it already has to bring new products to market focused on narrower niches, making the experience more relevant for the user. And third, the company continues to enhance its algorithm to provide a better experience for users and find a relevant match on first use of its product, a major goal of the company. Before discussing some of the IPOs that are scheduled for 2019, I feel I would be remiss if I did not also mention Booking here. 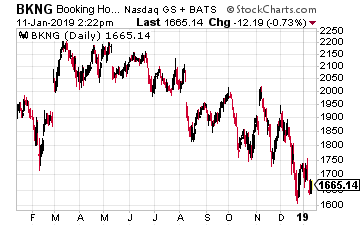 While I understand the stock is high priced, trading around $1,650, the valuation is fairly compelling. The stock currently has a PE of 19, is expected to grow earnings 16% per year on average over the next 5 years, and has profit margins of almost 20%.